Just 8% of marketers strongly believe they are effectively using images to drive email engagement. It should come as no surprise, then, that to reach consumers with relevant content, marketers are increasingly leveraging social media—a language consumers both know and love—within email marketing campaigns. According to a survey conducted by email marketing platform Movable Ink, nearly one-third of marketers are now merging the two marketing platforms. Movable Ink also found, however, that the majority of these integrations have been rudimentary thus far. For example, while 76% of emails include social media buttons, just 14% of emails are being optimized with social images. And while Instagram continues to be a workhorse for brands, Instagram images are used within emails less than 3% of the time. To the uninitiated, Instagram and email marketing may sound as disparate as Dolly Parton and Drake. But here’s the kicker. When you look at brands that have begun to use Instagram images within emails, the benefits are clear. One fitness retailer, for instance, delivered a 7X lift in engagement with product photos on their website just 24 hours after sending their first Instagram-infused email. The numbers don’t lie. To further explore what happens when beautiful Instagram images are featured within the body of an email, Curalate and Movable Ink created the following infographic. Scroll to the end for additional insights and examples. 1. Instagram is an untapped trove of images. While Instagram is generating extraordinary levels of engagement with content shared by brands, marketers are underutilizing these powerful images within emails. At the same time, marketers are still relying on Facebook when sourcing social content. It’s time to shift gears! 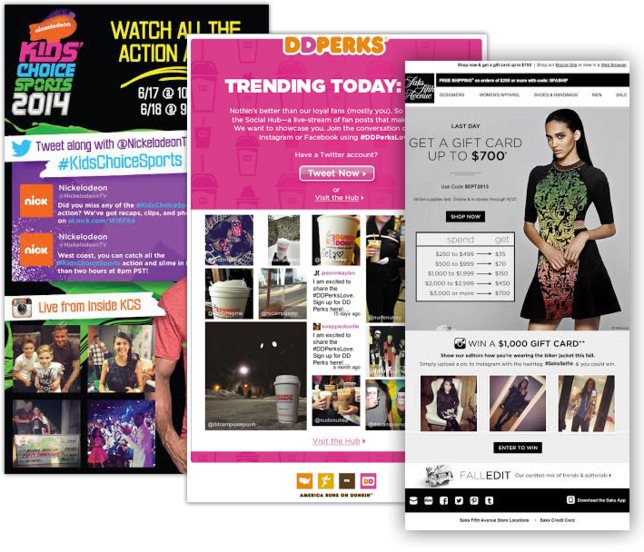 You can find three examples of great email integrations from Nickelodeon, Dunkin Donuts, and Saks Fifth Avenue here. 2. Not all Instagram images are created equal. That’s right. Some Instagram attributes are more desirable than others. For example, Curalate data shows that Valencia, Rise and X-Pro II deliver the highest revenue per impression within the ecommerce environment. What if you applied this image insight to your email creative too? You can’t just insert an Instagram image into an email template and expect engagement to soar. Be thoughtful when selecting which creative assets to use. For example, certain themes may resonate more than others during different times of the year. When this study was conducted, we saw a spike in seasonal themes, like “sun,” “water” and “travel.” What themes are driving action from your customers? Email continues to be an effective way for brands to connect with consumers. According to the 2015 State of Marketing Report from Salesforce, 73% of marketers—both B2C and B2B—agree that email is core to their business. Salesforce also reported that 79% of marketers rank email content and design as both the most critical and most effective aspects of an email. So why are marketers ignoring some of the most engaging creative assets they have? As consumers continue to show affinity for editorial-style images, it will become increasingly important for brands to showcase this content within emails. To ‘gram or not to ‘gram? That’s no longer the question. It’s the answer.